New research shows that 40m people in the UK now binge watch television series. 8 in 10 adults use services such as iPlayer, Netflix or Amazon, to watch multiple episodes of a series in one sitting. A third do so every week, and more than half do it monthly. The statistics are in Ofcom’s annual Communications Market Report, which highlights the differences between young and older people. Most binge viewers (70%) say they find it relaxing and enjoyable, while 24% says it’s an opportunity to discuss with friends. However, a third admitted that it had cost them sleep. 35% of binge viewers and 46% of young adults (16-24) say they’re trying to cut down on this way of viewing. This includes rationing (19%), finding a hobby (10%) and cancelling subscriptions (4%). 53% of 12-15 year olds do weekly “watch-a-thons.” That’s significantly higher than any other age group. This is partly driven by the fear of someone spoiling the series ending (25%). The days of linear television do appear to be fading, with more than a third of viewers watching TV on the move. That said 9 out of 10 respondents watched live television every week, with family viewing still an “integral part of family life”. 68% said watching TV can bring the whole family together for a shared viewing experience. Of streaming services, iPlayer is the most popular with 63% of adults saying they used it. ITV Hub is 40%, YouTube 38% and Netflix 31%. The report also looks into attitudes towards digital and online privacy. It found that 56% of parents don’t indulge in “sharenting” or sharing pictures of their children on social media. The main reason for this (87%) is that they wish to keep their children’s lives private. 42% of parents do, however, share photos of their children and half of these do so at least once a month. Of this 42%, more than half said their children were happy for them to do so; 84% said they only shared photos or videos their children would be happy with; and 85% said they were careful about who can access the material. 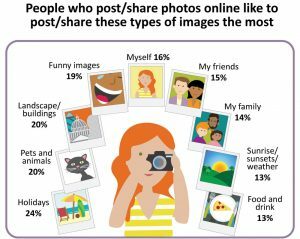 More than a third (34%) of 18-24 year olds said that the most commonly posted images were selfies. 71% of these said that it was important to look their best, while 47% said they did feel pressure to look good online. This attitude is more common among women (82%), than men (58%).